GAPs training programs at OSU provide growers with the knowledge and tools needed to implement on-farm best management practices to reduce fresh produce safety hazards and ensure that their product is safe. The training programs also assist growers with achieving USDA GAPs certification or Group GAPs certification. 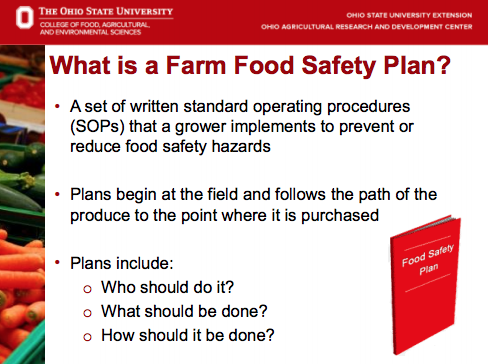 Basic GAPs trainings are conducted by OSU Fresh Produce Safety Team members. Trainings are three hours and participants receive a certificate of completion at the end of the training. Each participant also receives recordkeeping materials and factsheets. Each training cost $30, which helps to cover the cost of training materials. Upcoming program dates, times and registration forms are listed on the Program Dates page. If you have a group of growers (>10) who are interested in participating in a GAPs training during a specific month or at a specific location please contact Eileen Ramsay (OSU Assistant GAPs Coordinator) or your County Extension Office to request a training. The following materials are provided to growers at GAPs trainings. These materials are not a substitute for attending a training but will provide you with the basic content that is covered in a training. Food Safety Plan writing workshops are currently being developed to assist growers with preparing an on-farm food safety plan. The workshops will be held across the state and participants will work in teams of four with an OSU Fruit and Vegetable Safety team member to write a food safety plan speicifc to their farm and farming practices. The goal of this workshop is for every participant to leave with a completed and printed food safety plan. For more information on the workshops please contact Drs. Melanie Lewis Ivey or Sanja Ilic.